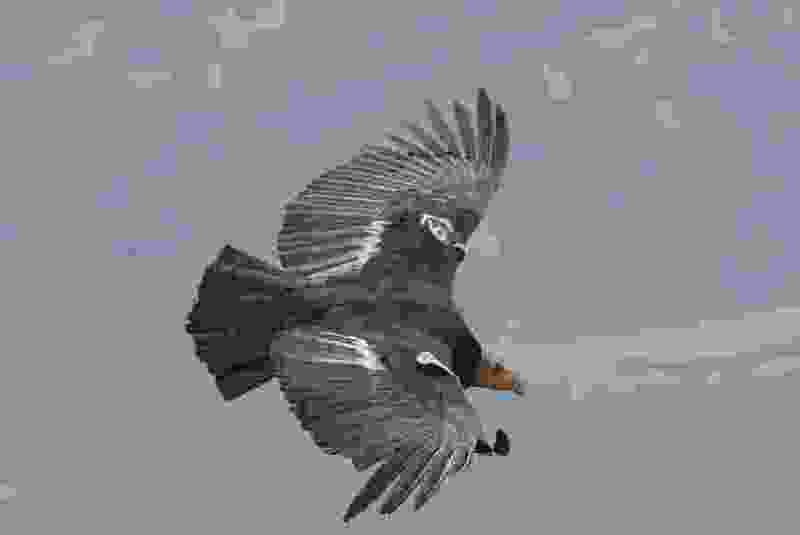 Chris Parish | Courtesy The Peregrine Fund File photo of an adult California condor from the Arizona/Utah population. Angels Landing’s sheer sandstone face in southern Utah’s Zion National Park will largely remain a rope-free zone for a while to avoid disturbing a pair of California condors that recently established a nest nearby. It contains precious cargo: an egg that observers hope will hatch a chick in early May. This long-winged scavenging species is recovering from the verge of extinction, but condors have yet to reclaim permanent residence and produce young in one of the most protected landscapes in their native range. Zion officials and bird lovers hope that changes this fall when Condors 409 (the would-be mother) and 523 are expected to fledge the chick that will hatch from the egg they are taking turns tending in the nest on Minotaur Tower, according to a post on the park’s Facebook page. Thanks to captive breeding, condor numbers have rebounded from the brink; but, due to lead ammunition, many birds die prematurely from lead poisoning, forestalling real recovery. These far-roaming birds can ingest lethal doses of lead when they dine on gut piles left by big-game hunters. When bullets strike a deer, they shatter and lace the entrails with lead fragments. It is not uncommon to find condors dead in Zion, poisoned by lead they ate outside the park after hunting season. Zion biologists estimate the park’s latest egg was laid in mid-March, with a hatch date in early May. The parents are a couple that have been spotted in the canyon for the past two years, but they have yet to produce a chick together. The female once had another mate, No. 337, that died of lead poisoning in June 2016 during nesting season, according to the Facebook post. Their chick disappeared that September without fledging. That couple had another chick in 2014 that died before fledging. In the decades since the California condor was driven to near extinction, a chick has yet to successfully fledge at Zion. A lot of eyes will be trained on Minotaur Tower this summer tracking the progress of this couple’s chick. Stay tuned.